Recipe in hand, I hit the kitchen. I followed the instructions perfectly, “cream the butter and sugar, add the beaten eggs (I know, it’s kind of a killer to use four of them), and sift the flour and baking powder”, then I tossed in my extras. The winning combination: cinnamon, nutmeg, and ginger. I had no idea what I was doing. I used them in pumpkin bread before and . . . yeah, that was about the extent of my knowledge when it came to these spices. Okay, moving on. Half a teaspoon of cinnamon didn’t seem like enough, so I added another scoop, and since nutmeg and ginger were strong spices to begin with, I only put 1/4 of each and mixed it in. Lookin’ good. Oh, so you know, there aren’t any bake times on the recipe, but I found that 350 degrees for 13 minutes did the trick. 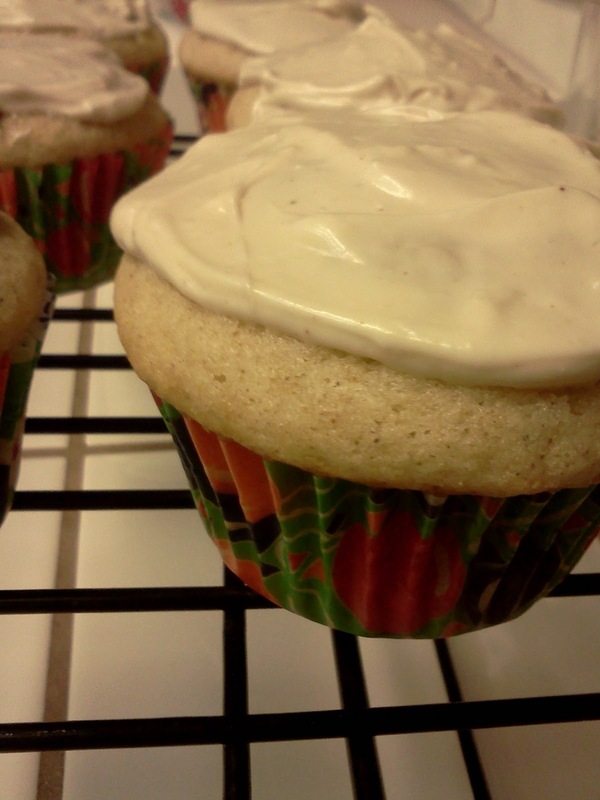 Now, cupcakes aren’t cupcakes without frosting. Guess what I picked for my spice-cupcakes. Pause for effect. 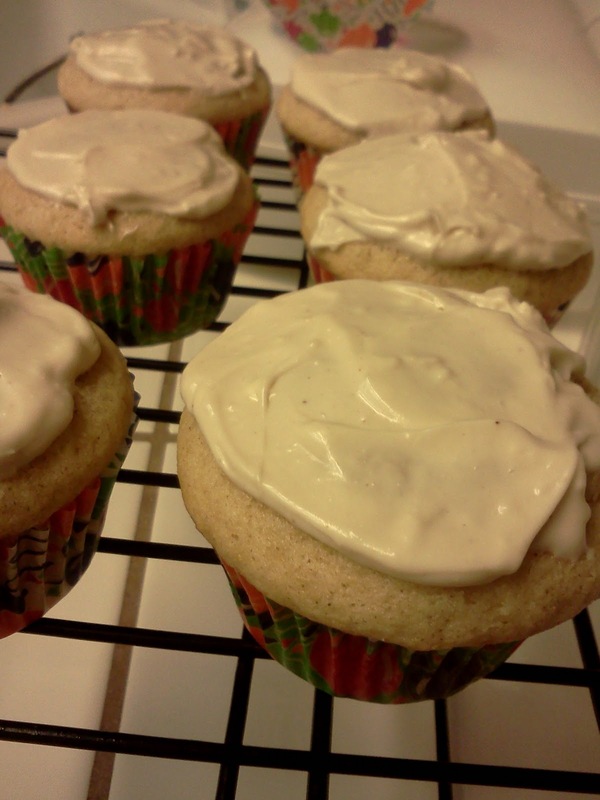 Cream cheese frosting! (http://simplyrecipes.com/recipes/cream_cheese_frosting/) Ohhhhh yeah. Nothing better. I thought that using a whole package of cream cheese was a little much, so I only used half. Oh, by the way, tasting the cream cheese after you put in the vanilla may be tempting, but don’t try it. It’s disgusting, believe me. I think that blast of nastiness messed up my taste buds because from then on, my excited-about-cream-cheese-frosting fire, died. Sad, I know. I read somewhere that you can tell a cupcake is done if it springs back from your fingertips. My excitement grew. The cupcake performed that trick beautifully. I took the first batch out of the oven and waited a bit for them to cool off before sinking my teeth in . . . Mmm, I’m in love. Moist, spongy goodness. Est parfait! Se magnifique. I was caught secretly loving on a cupcake, and immediately, my family started asking if they could have one. I must have made it look good. Hey, I should be on a commercial. 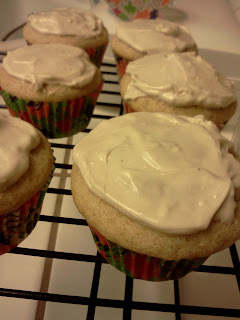 Well, my excuse for delaying my families eating time was that I hadn’t frosted them yet. So if they wanted cream cheese frosting (which I knew they did) they’d have to wait. Ducking down, I scooped some frosting and smeared it on my cupcake to try. Not bad, not bad. The only problem with the cupcake was that it didn’t taste very much like spices. I don’t know, maybe it was just me. Mom said that it had too much ginger for her. So, I guess we each have our own opinion. Next time, I’m going to try more cinnamon. The frosting was pretty strong, I felt like it took away the spice taste. But Dad, my dessert proffesionair, told me that the frosting was good and, if anything, the cupcake needed more of it. That was good enough of a reason for me. I spread frosting over each cupcake. They were beautiful. My only complaint, except for the fact that I didn’t feel they were spice-y enough, was that the frosting was weird the next day. Kind of gooey, thick, and sticky instead of the creamy lightness it was before. The only thing I could think of that could have cause it was that I stored them in the microwave overnight. I don’t know how that goes with the health code or whatever, but they usually don’t last more than two days, and they’re safe from the cat behind closed microwave doors. But that was it. All in all a success. Bet you didn’t see that one coming. Mmmm…cinnamon, nutmeg, and ginger- three of the greatest tasting spices in the world. ;} as far as sweets go!